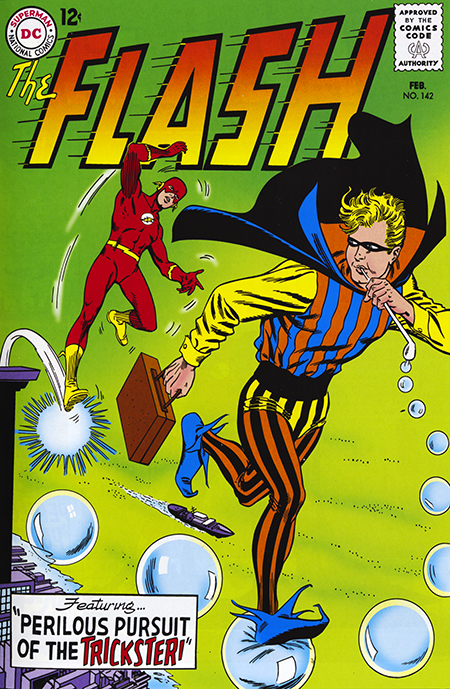 This Flash cover is almost identical to two other Trickster covers including the one for the issue in which a certain funky cartoonist’s (ahem, me) letter appeared. I guess when something seems to be working… don’t mess with it. Except, that as far as DC Comics were concerned, things weren’t going to be working quite as well going forward. As always seems to be the case following any innovation, DC’s transformation and modernization of the super hero genre was just on the cusp of settling into it’s own rut. An elegant, mannered, and very stylish rut to be sure, but a rut nevertheless. And there were distractions galore for loyal DC fans. I’ll admit that my own head was starting to turn. The sixties were about to become THE SIXTIES. Pop culture was exploding. The Beatles were at full throat, James Bond and The Man From U.N.C.L.E. exploded on the scene, the first Comicon takes place in New York, and, of course, Marvel Comics is continuing its rise to the top. And let’s not forget girls. The first wave of baby boomers, and DC’s core audience up until this point, was starting to grow up. In this issue DC’s beautiful house house style in both writing and art is on full display. The Trickster story is clever and fun, and the back-up piece is a nicely told SF tale. Perfection in every way. Everything is exactly as we had come to expect… and that was soon to become a problem for DC.